Heat Oil in a big kadai. Mix besan, rice flour, red chilli powder, asafotida powder, baking soda, kesar colour, salt and make a batter like dosa batter. Using Boondi ladle, pour this batter little by little through the holed boondi lader in the hot oil. Fry the boondies till crisp. Strain it and keep aside. Finish all the batter and make boondi. 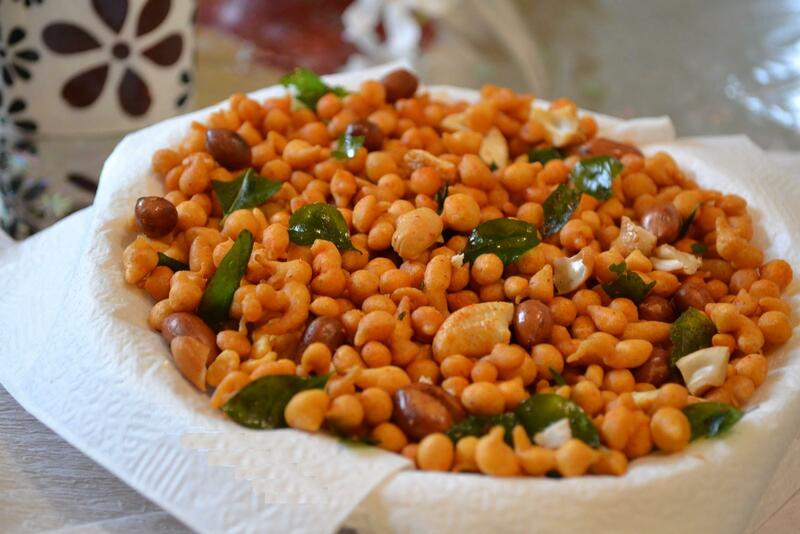 In a small kadai put two teaspoon of oil and fry the curry leaves, peanuts, cashew nuts and garlic crushed slightly. Add it to the karaboondhi. Sprinkle little chilli powder and salt on top of it. Mix well and store it in an air tight container.